Our pressure washing service can also be used for stone cleaning and masonry restoration projects. Many older buildings can become discoloured over time, covered with traffic film and other general airborne pollutants. 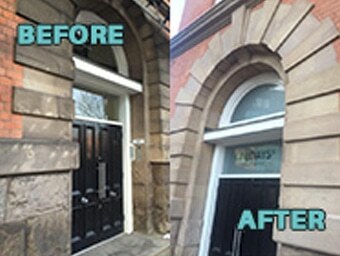 Our pressure washing engineers can treat old masonry and natural stonework to restore it to its original appearance. Facts about soda blasting, equipment and Armex Soda Blasting Media “Soda blasting is a process in which sodium bicarbonate is applied against a surface using compressed air. It is a very mild form of abrasive blasting, much milder than sandblasting. Soda blasting is a non-destructive method for many applications in cleaning, paint & varnish stripping, car restoration, industrial equipment maintenance, rust removal, graffiti removal, molecular steel passivation against rust, oil removal by saponification and translocation, masonry cleaning and restoration, soot remediation, boat hull cleaning and for food processing facilities and equipment and teeth cleaning at the dental office. Soda blasting can be used for cleaning timber, wood, oak beams, oak floors, doors, stairs & bannisters, cars, boat hulls, masonry, and food processing equipment. Soda blasting can also be used to remove graffiti and to clean structural steel. Soda blasting is very effective for mould and fire/smoke damage clean-up as it cleans and deodorizes. AquaBlast uses professional high pressure cleaning equipment to restore all types of brickwork on both commercial and domestic properties. Our specialist stone cleaning services are suitable for natural stone walls and floors.